Habanero chili peppers come in a variety of colors (usually red or orange), and sometimes are confused with Scotch Bonnet peppers. Scotch Bonnets are a very good substitute for Habaneros (they come from the same family of peppers) and the rule of thumb for telling the difference between them is that the Scotch Bonnet is squatty, and shaped somewhat like a Scottish cap called a tam, while the Habanero is more elongated and tear-drop shaped. Habanero chilies are among the hottest of all types of chili. Measuring in at 200,000 and 300,000 Scoville units, the habanero is about 100 times hotter than jalapeño peppers. Habaneros are typically smallish peppers and range from yellow to orange when ripe. Popular in Caribbean cuisine, habaneros are often used in marinades and sauce dishes, like jerk chicken. When pronouncing the word "habanero," the H is silent and the N is a normal N, not an ñ. Many people mis-pronounce the N silmilar jalapeño. 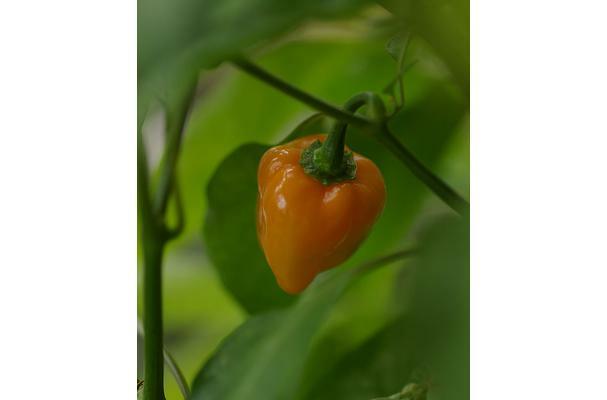 Generally a ripe habanero pepper is between .8 and 2.4 inches in length and comes in a few different colors; red and orange being the most prevalent, though white, brown and pink varieties are also sold. No matter the color of the pepper's skin and flesh, overall shape of the habanero is oblong, or ovoid, with the stem end being heavier and more rounded while the flower end is tapered, sometimes sharply. Choosing: Choose peppers that are plump in appearance, lacking any visible withering, bruises, brown spots, or blemishes. Buying: Red and orange habanero peppers are widely available in chain-stores, supermarkets, farmers' markets and fruit and vegetable stands. The more exotic colors can occasionally be found in the same places. Many seed catalogs carry these exotic-colored peppers as seeds and can be ordered for growing at home. Procuring: Habanero peppers thrive in hot weather. They prefer slightly acidic soil with good morning sun and good drainage. Habanero plants should only be watered when the soil is dry; overwatering is a common cause of bitter fruit in these plants. Habanero plants make good additions to container gardens. In tropical to sub-tropical zones the plants are perennials and will set fruit throughout the year. In temperate zones the plants are most often annuals. Habanero peppers have a wide range of cuilinary uses. Cleaning: To mellow the heat of the peppers, slice the peppers in half lengthwise, then gently scrape away the ribs and seeds. The ribs and seeds of the pods hold the majority of the capsaisin in chiles. If you have sensitive skin, it's best to wear a pair of food grade latex gloves when cleaning/using habanero peppers. Be sure to keep your hands away from your face, most specifially your eyes, nose and mouth. Once your chiles are cleaned and prepped for your recipe, remove your gloves, throw them away, and wash your hands thoroughly under warm running water. Hi, I have some Habanero plants that I grew from seeds. They are just now turning orange and one or two are a little closer to red. When do I pick them? and how long will they be good for after picking them? Also can I take some of the seeds out of one of the peppers and plant it? Will that actually work?